5-1546 PROGRAM TRACKING AND REPORTING SUBSYSTEM (PTRS) ACTIVITY CODE. 1578. In the “National Use” block, add “Initial,” “Denial,” “Renewal,” “Reevaluate,” “Reinstatement,” or “Rescind” to capture the type of activity conducted. 5-1547 OBJECTIVE. The main objective of this task is to determine whether to issue Federal Aviation Administration (FAA) Form 8710-7, Statement of Aerobatic Competency (SAC), to an applicant (see Figure 5-165). Completion of this task results in the issuance or denial of a SAC. Additional tasks may involve the renewal, reevaluation, or rescission of a SAC. NOTE: The terms aerobatic and acrobatic are synonymous. A. FAA Aerobatic Competency Evaluation Program (ACE Program) Background. The FAA ACE Program has been administered by Recognized Industry Organizations (RIO) since 1991. 1) In the past, most pilots found it advantageous to simply go to the local Flight Standards District Office (FSDO) for an annual evaluation or renewal instead of using an industry evaluator for peer review and recommendations. 2) The FAA found it necessary to appoint inspectors in each FSDO to conduct these evaluations. However, the FAA was not always able to designate an adequately trained inspector who had related experience. Consequently, flight evaluations were sometimes inequitable. 3) Efforts to correct these inadequacies revealed that it was not cost-effective to attempt a nationwide training program for inspectors in this specific task because of the relatively low demand for the evaluation. 4) Other safeguards built into the air show environment have prevented the public from being placed at any undue risk. However, 12 performing pilots suffered fatal accidents within 1 year. Although the number of accidents was generally no greater than in previous years, and many of the accidents did not take place at an air show, the accidents did appear to be related to aerobatic competency. These accidents served as a catalyst toward more aggressive evaluation of the aerobatic competency of air show pilots. 5) It is generally agreed that the level of safety of any segment of the industry is critically dependent upon that industry’s assuming responsibility for itself and its safety programs. In this instance, the air show industry was very proactive in its steps to alleviate future events that would reflect negatively on General Aviation (GA). Within a very short time, two industry groups proposed a revamping of the evaluator program to include new techniques and procedures and designation of additional industry evaluators. 6) The most encouraging part of the program is that it is well-orchestrated and directly affects virtually all active air show pilots in the United States and Canada. Moreover, the industry is providing a database of information on air show pilots and their competency checks. Such a fund of information is unprecedented, and the program far exceeds the FAA’s capabilities for action in light of other priorities. This action has significantly advanced air show safety with little cost to the public. 7) The FAA continues to maintain its position that industry-designated evaluators under an FAA‑accepted ACE Program are people who are credible and dedicated to fulfilling their duties to conduct peer review and counsel, and that they make appropriate recommendations to the FAA for the issuance, renewal, reevaluation, and rescission of a SAC. B. Requirements. By FAA policy, a pilot who wishes to perform aerobatics or certain other flight operations at an aviation event (air show) issued FAA Form 7711-1, Certificate of Waiver or Authorization, must possess a valid SAC or Transport Canada (TC) Form 26-0307, Statement of Aerobatic Competency (SAC)/Attestation de Compétence en Voltige Aérienne (ACA) (see Figure 5-167). 1) This requirement is further mandated by the special provisions that are part of a Certificate of Waiver (CoW) for an air show issued by the FAA. 2) A pilot obtains a SAC by successfully completing an aerobatic competency evaluation in accordance with the provisions of an FAA-accepted ACE Program and given by an industry-designated aerobatic competency evaluator (ACE). • EAA WoA at http://www.warbirds-eaa.org/programs/aerobatic.html. 5-1549 AEROBATIC COMPETENCY. In order for a pilot of a civil aircraft to perform aerobatic and certain other maneuvers at air shows authorized by a CoW, the pilot must have a valid FAA Form 8710-7 or a TC Form 26-0307 in his or her possession. A. Validity. Either of these forms must have been issued within timeframes set forth in the RIO’s ACE Program, or as directed by the General Aviation and Commercial Division. An FAA Form 8710-7 or a TC Form 26-0307 is no longer valid after the expiration date. B. Not Required. A SAC is not required if a pilot is competing in an Aerobatic Contest Box (ACB) authorized by a CoW for that specific purpose; if a pilot is practicing in an aerobatic practice area (APA) authorized by a CoW for that specific purpose; or for closed-course air racing authorized by a CoW for that specific purpose. A SAC or applicant for a SAC evaluation is required for a civilian pilot operating in an Aerobatic Competency Evaluation/Practice (ACE/P) operations area. C. SAC Evaluations. Individuals requiring a SAC will be referred to an ACE as designated by the RIO for a SAC evaluation in accordance with the RIO’s ACE Program. An ACE will forward a written recommendation to the FSDO through the appropriate RIO. The ACE will also recommend the authorized aircraft, standard aircraft categories, levels, and endorsements to an individual’s SAC based upon observed performance (see Figure 5-166, Aircraft Category, Level, and Endorsements for FAA Form 8710-7). D. Rotorcraft. An appropriately qualified and designated ACE will evaluate individuals requiring a SAC to conduct flight demonstrations performed in rotorcraft. 5-1550 ISSUANCE OF A SAC. 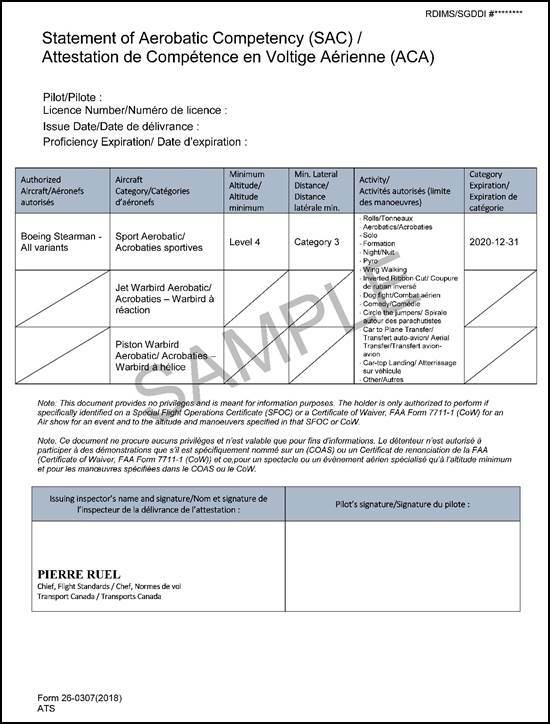 An aviation safety inspector (ASI) issues a SAC based upon an applicant’s successful completion of a SAC evaluation that includes an oral examination and, if required, a flight demonstration as specified in the RIO’s ACE Program. An appropriately qualified and designated ACE conducts the SAC evaluation. The RIO develops and publishes the evaluation procedures and policy that the FAA (General Aviation and Commercial Division) and Transport Canada subsequently accept. A current copy of the RIO’s ACE Program may also be found on the FAA employee intranet site at https://my.faa.gov/org/linebusiness/avs/offices/afx/programs/airshows.html. A. ACE’s Role. After requesting the required information about the pilot from the RIO, an appropriately qualified and designated ACE conducts the evaluation. After the evaluation is completed, including all the requirements established in the RIO’s ACE Program, the ACE notes his or her recommendations on the applicable industry SAC Application/Recommendation Form. B. Application Processing. The completed industry SAC Application/Recommendation Form is forwarded to the RIO for processing in accordance with the RIO’s ACE Manual. The RIO records the information and sends the application to the appropriate FSDO. Applications from Canadian airmen will also be forwarded to the appropriate FSDO for processing. The cover letter must also include a draft SAC or a TC Form 26-0307 for the applicant. If the application is for renewal, the industry SAC Application/Recommendation Form must be submitted to the FSDO not later than 15 days prior to the expiration date of the SAC. C. Application for Issuance/Renewal. Although the evaluation program is administered by the RIO, the FAA is the final authority on issuance of a SAC. The FSDO may accept or deny any applicants referred by the RIO. For each prospective SAC applicant, the ASI will query the Enforcement Information System (EIS), Accident Incident Data System (AIDS), or Safety Performance Analysis System (SPAS). The appropriate FSDO will deny a SAC application if the applicant is currently under investigation or subject to a pending action by the RIO or the FAA (see Figure 5-170, Sample Letter Denying FAA Form 8710-7). • Draft FAA Form 8710-7. 2) If any of the documentation or required information is missing from the application, contact the RIO before issuing the SAC. Also, in those very rare instances when an FAA ACE inspector conducts the evaluation, a SAC will not be issued to the applicant until the FAA ACE inspector has completed the necessary coordination and background records review with ICAS or EAA WoA, which maintains records on all individuals who hold a SAC. D. Designated FAA ACE Inspectors. Only FAA inspectors designated as FAA ACE inspectors are authorized to conduct aerobatic competency evaluations. Inspectors who are designated as FAA ACE inspectors may in rare instances conduct aerobatic evaluation and subsequently issue a SAC only after receiving prior approval from the National Aviation Events Specialist (NAES), in coordination with and after giving notification to the RIO. In such a case, they will follow all evaluation procedures set forth in the RIO’s ACE Program. E. Initial Issuance, Reinstatement, or Renewal. An evaluation by an appropriately qualified and designated ACE is required for initial issuance, reinstatement, or renewal of a SAC. F. Forms. 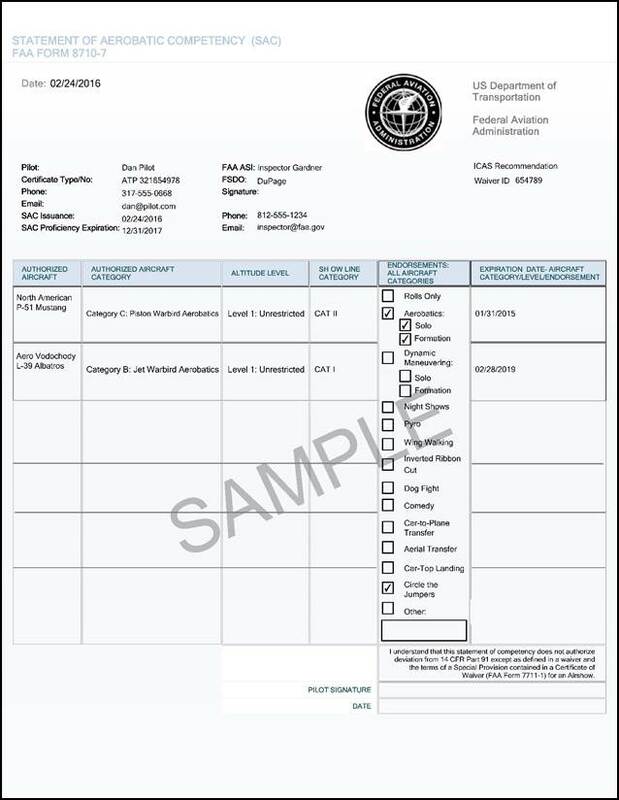 FAA Form 8710-7 is used to issue a SAC (see Figure 5-165) and can be found on the FAA eForms website at https://eformservice.faa.gov/eForms.aspx. (ICAS and EAA WoA have individual forms.) This form expires in accordance with industry guidelines. LOA J503, Letter of Authorization for Aerobatic Competency, issued from the FAA Web-based Operations Safety System (WebOPSS), may be used in lieu of FAA Form 8710-7. A. Determining if the Performer Was a Contributing Factor. The inspector-in-charge (IIC) for the event should coordinate with the NAES, AES, Transport Canada, and the RIO immediately to determine if the air show performer was a contributing factor to the accident. B. Determining Course of Action for Reevaluation of Competency. The IIC for the event will coordinate with the NAES, AES, Transport Canada, and the RIO to determine the appropriate course of action, if determined necessary, for reevaluation of the performer’s competency to hold the SAC or TC Form 26-0307. C. Rescinding the Performer’s SAC. When an accident or incident investigation reveals that the air show performer’s actions were a contributing factor, the air show performer’s SAC shall be rescinded pending successful completion of a SAC reevaluation. 5-1552 REEVALUATION OF COMPETENCY TO HOLD AND/OR RESCISSION OF A SAC. In accordance with FAA policy, after successful completion of an evaluation for a SAC, a designated ACE recommends to the FAA that a SAC be issued to an air show performer. Therefore, when safety concerns so dictate, it is also FAA policy that the FAA may require reevaluation of a performer’s competency to hold and/or rescind a performer’s SAC. A. High Standard of Safety. These actions are only intended to achieve a high standard of safety by assuring future compliance with FAA safety rules and policy. They are not intended to be punitive, and are separate, apart from, and may not necessarily relate to any enforcement action or the final determination of probable cause of an accident. 1) Anytime an air show performer’s actions give the FAA or the RIO reason to doubt their aerobatic competency, the performer’s competency to hold a SAC should be reevaluated and/or rescinded. 2) An air show performer who exhibits a flagrant and willful disregard for FAA safety rules and policy or has established a pattern of negative behavior or performance will have his or her SAC immediately rescinded (see subparagraph 5-1552C). 3) In a large part, aerobatic competency as it relates to the issuance of a SAC equates to safe air show performance during the performer’s entire routine, not just their skill at performing individual aerobatic maneuvers. B. Reevaluation of Competency. Minor incidents such as isolated, momentary transgressions across an assigned show line or below a minimum altitude are not grounds for reevaluation but should be corrected by on-the-spot counseling and constructive criticism. The action of counseling, providing constructive criticism, or reevaluating an air show performer’s SAC may be initiated by the FAA or the RIO. All decisions to reevaluate an air show performer’s SAC shall be processed, with concurrence from the General Aviation and Commercial Division, in accordance with RIO’s ACE Program. The issuing FSDO or the FSDO conducting the investigation of an incident or accident is responsible for officially notifying an air show performer of the decision to reevaluate their competency to hold a SAC. (See Figure 5-168, Sample Letter Rescinding FAA Form 8710-7 Per Recommendation of the FAA, or Figure 5-169, Sample Letter Rescinding FAA Form 8710-7 Per Recommendation of ACE Organization.) Mitigating factors, such as unforecast winds at altitude, should also be considered. However, if the incident that gave reason to doubt the airman’s competency is not of a serious enough nature that it would require rescission of the performer’s SAC, it may still be necessary to require reevaluation of the performer’s competency to hold the SAC. 1) The air show performer’s SAC shall be rescinded pending successful completion of a SAC reevaluation. Therefore, it is important that the air show performer complete the reevaluation within 30 days. 2) In all cases, when a reevaluation is required, privileges are suspended effective immediately. 3) If the air show performer whose SAC has been rescinded fails to submit to a reevaluation, the SAC remains rescinded indefinitely pending the SAC holder’s successful completion of a reevaluation. 4) The performer can choose to surrender their SAC in lieu of a reevaluation. In that case, the air show performer must notify the RIO and the FAA, in writing, that they decline to submit to a reevaluation and voluntarily surrender their SAC. The surrendered SAC and copies of all correspondence related to the reevaluation shall be forwarded to the issuing FSDO (see subparagraph 5-1550B) and a copy sent to the appropriate RIO. 5) Reevaluations will be initiated by the appropriate FSDO. For example, a reevaluation of the performer’s competency to hold a SAC that resulted from an accident or incident at an air show would be initiated by the FSDO that issued the CoW for the event. (See Figure 5-168.) Additionally, the FSDO that issued the SAC will be notified of the request for reevaluation and copied on all correspondence related to the reevaluation. 6) Any incident that occurs during any portion of an air show routine that negatively affects the safety of spectators, regardless of damage or injury, shall be grounds to doubt a performer’s aerobatic competency. 7) Incidents or accidents that involve the holder of a SAC outside of the air show environment must be reported to the appropriate RIO. a) The holder of a SAC must notify the appropriate RIO within 24 hours. b) A FSDO conducting the investigation of an incident or accident that involves the holder of a SAC must notify the appropriate RIO and the FSDO that issued the SAC within 24 hours. c) The RIO that recommended the issuance of the SAC may make a recommendation to the FAA to reevaluate the performer based on the information received. 8) For all reevaluations, the RIO will assign an evaluator other than the evaluator who issued the SAC. The evaluator will conduct the reevaluation in accordance with the RIO’s ACE Program. C. Rescission of a SAC. If the incident that gave reason to doubt the airman’s competency is of a serious nature, it is then necessary to immediately rescind the performer’s SAC pending reevaluation (see Figure 5-169). The action of rescinding a SAC may be initiated by the FAA or the RIO. All decisions to rescind a SAC shall be processed, with concurrence from the General Aviation and Commercial Division, in accordance with the RIO’s ACE Program. 1) Any accident or incident that occurs during any portion of an air show routine that directly threatens the safety and well-being of spectators, regardless of damage or injury, shall be grounds to rescind a performer’s SAC. 2) Rescinding a SAC will be initiated by the appropriate FSDO. For example, rescinding a performer’s SAC as a result from an accident or incident at an air show would be initiated by the FSDO that issued the CoW for the event. (See Figure 5-169.) Additionally, the FSDO that issued the SAC will be notified of the decision to rescind the SAC and copied on all correspondence related to the reevaluation. 3) It is important that the rescission of the performer’s SAC be completed before the next opportunity for the performer to perform at an air show. D. Appeal. A performer who has been requested to submit to reevaluation and/or had their SAC rescinded shall have the right to appeal this action in writing to the General Aviation and Commercial Division Manager (see subparagraph 5-1550B). 5-1553 FAA SAC EVALUATIONS. All FAA SAC evaluations (initial, reissuance, reevaluation, and renewal) must be referred to a RIO that has developed an acceptable method of making recommendations of aerobatic competency to the FAA and has an FAA-accepted ACE Program. The FAA may conduct SAC evaluations only as dictated by unusual situations (see subparagraph B). A. Rotorcraft Operations. At present, there are only a limited number of aerobatic rotorcraft operations. Appropriately qualified and designated ICAS ACEs evaluate all rotorcraft operations. B. FAA ACEs. The FAA no longer maintains current and qualified personnel who are skilled in evaluating air show aerobatic competency. Occasionally, the General Aviation and Commercial Division, in conjunction with the NAES, may have a need to identify an individual ASI to help resolve unusual problems or situations. However, this FAA SAC evaluator will not conduct routine SAC evaluations. 5-1554 REQUIREMENTS. The issuance of a SAC requires an evaluation and recommendation by an ACE, such as designated by a RIO with a valid FAA-accepted ACE Program. Although the industry administers the evaluation program, the FAA is the final authority on issuance of a SAC. 5-1555 REFERENCES, FORMS, AND JOB AIDS. • Advisory Circular (AC) 91-45, Waivers: Aviation Events. • ICAS ACE Program Letter of Authorization. • ICAS List of ACEs. • EAA WoA ACE Program Letter of Authorization. • EAA WoA ACE Manual. • EAA WoA List of ACEs. • FAA Form 8710-7, Statement of Aerobatic Competency (SAC) (Figure 5-165). • Transport Canada (TC) Form 26-0307, Statement of Aerobatic Competency (SAC)/Attestation de Compétence en Voltige Aérienne (ACA) (Figure 5-167). A. Obtain Application. An applicant for a SAC should contact a RIO to obtain the industry SAC Application/Recommendation Form. In the rare instance that the FAA is to conduct the evaluation as dictated by an unusual situation and approved by the General Aviation and Commercial Division NAES, the applicant should appropriately complete FAA Form 8710-1. B. Schedule Evaluation. With the SAC Application/Recommendation Form, the individual also receives a copy of the checklists that will be used for the SAC evaluation. The individual contacts an appropriately qualified and designated ACE and schedules the time and location of the ground and flight SAC evaluation. 1) Review of the submitted SAC Application/Recommendation Form, cover letter, and coordination with the appropriate industry group. NOTE: The ASI may use FAA eForm 8710-7 or LOA J503, issued from FAA WebOPSS, in lieu of FAA Form 8710-7. 2) Sign and date the form using the date of the evaluation; the form expires in accordance with the RIO’s ACE Program guidelines. 3) Make copies of the SAC for the FSDO files. 4) Electronically forward the SAC to the pilot at the address shown in the cover letter with an electronic copy to ICAS. Send an electronic copy to EAA WoA only when an EAA WoA SAC Application/Recommendation is submitted to the FSDO. Do not forward a copy to the Airmen Certification Branch. 5) Make the appropriate PTRS entry. NOTE: ICAS will retain electronic copies of all SAC evaluation documentation (for ICAS and EAA WoA). • The inspector could take part in an investigation as a result of an accident, incident, FAA/RIO formal complaint, or violation of the regulations, and be called upon to rescind FAA Form 8710-7, or require reevaluation. • FAA Form 8710-7 may be rescinded based on the facts, conditions, and circumstances of an accident, incident, or FAA/RIO formal complaint that raises doubt about the pilot’s aerobatic competency. The following is a listing of maneuver limitations for use in completing FAA Form 8710-7, Statement of Aerobatic Competency (SAC). 1) Category: A generic classification of aircraft with similar performance capabilities. a) Category A: Sport Aerobatics. b) Category B: Jet Warbird Aerobatics. c) Category C: Piston Warbird Aerobatics. d) Category D: Sailplane Aerobatics. e) Category E: Helo Aerobatics. 2) Level: Minimum altitude above ground level (AGL) authorized to start and complete aerobatic maneuvers. a) Level 4: 800 feet. b) Level 3: 500 feet. c) Level 2: 250 feet. n) Car-Top Landing  300 foot Limitation. p) Other, as specified by the evaluator and approved by the ICAS ACE committee and General Aviation and Commercial Division National Aviation Events Specialist (NAES). B. EAA WoA ACE Program. a) Category B: Jet Warbird Aerobatics. b) Category C: Piston Warbird Aerobatics. 2) Level: Minimum altitude AGL authorized to start and complete aerobatic maneuvers. b) Loops, Rolls, and any Combination Thereof. Investigation of the [accident/incident/formal complaint] which occurred at [location] on [date] gives reason to believe that your competency to hold FAA Form 8710-7, Statement of Aerobatic Competency (SAC), is in question and that reevaluation of your qualification to be the holder of a SAC is necessary in the interest of safety. Therefore, pursuant to FAA policy, you are requested to arrange for a reevaluation of your qualifications to hold a SAC within [number] days. An evaluator will be assigned to conduct this reevaluation by the Recognized Industry Organization (RIO) that recommended the issuance of your current SAC. Upon successful completion of an aerobatic competency evaluation, you may be issued another SAC. Pursuant to FAA policy and pending the outcome of the ongoing investigation, you may be given the opportunity for reevaluation of your qualifications to hold a SAC. An evaluator will be assigned to conduct this reevaluation by the RIO that recommended the issuance of your current SAC. Upon successful completion of an aerobatic competency evaluation, you may be issued another SAC. You are not authorized to exercise the privileges of your SAC until the reevaluation has been completed and a determination that your competence is no longer in question. You must surrender your SAC within 24 hours. Please return your SAC to this office at [FSDO address]. If, for valid reasons beyond your control, you are unable to be reevaluated at this time, please contact [inspector-in-charge (IIC)] as soon as possible so that a determination can be made as to whether a time extension may be granted. This office has notified the [office title] FSDO that issued your SAC and [ICAS or EAA WoA] of this accident/incident/formal complaint and this issuance of this letter rescinding your SAC. You can appeal this action in writing to the Division Manager, General Aviation and Commercial Division, 800 Independence Avenue SW, Washington, DC 20591. Should you have any questions concerning this matter, please contact this office at [FSDO telephone number]. This letter is to inform you that as of this date, your FAA Form 8710-7, Statement of Aerobatic Competency (SAC), is rescinded. Please return your SAC to this office at [FSDO address] within 24 hours of receipt of this letter. This rescission is based on [the recommendation of [ICAS or the EAA WoA] [the events of [date of accident, incident, or formal complaint]]. This recommendation gives reason to believe that your competency to hold a SAC is in question and that reevaluation of your qualification to be the holder of a SAC is necessary in the interest of safety. Therefore, pursuant to FAA policy, you are requested to arrange for a reevaluation of your qualifications to hold a SAC within [number] days. An evaluator will be assigned to conduct this reevaluation by [ICAS or the EAA WoA], the Recognized Industry Organization (RIO) that recommended the issuance of your current SAC. Upon successful completion of an aerobatic competency evaluation, you may be issued another SAC. This office has notified the [office title] FSDO and [ICAS or EAA WoA] of this accident/incident/formal complaint and this issuance of this letter rescinding your SAC. This letter is to inform you that your application for FAA Form 8710-7, Statement of Aerobatic Competency (SAC), is denied. RESERVED. Paragraphs 5-1559 through 5-1575.